Essa painting is the premier painting contractor of choice for Barrie and area. We are highly motivated and fully capable of completing projects of any size or complexity. Please view our gallery of projects to see the wide range of work that we have done for the painting industry. We do everything from commercial and industrial painting to basic white boxes and touch ups. We pride ourselves on our ability to complete your project right the first time at the right price. Our professionally trained teams will get your project looking it's best. Our goal is to create long lasting relationships with our clients by working with you on your projects, and exceeding your expectations. We feel that your satisfaction is our number one priority, and that is why we provide you with a fair and affordable price from the start. We also ensure quick turnaround time and minimal disturbance so you can get back to other things. We do the cleanup and rearrangement and then encourage you to inspect the job after completion to assure satisfaction. All our job sites are fully insured and inspected to assure the safety of clients and crew. 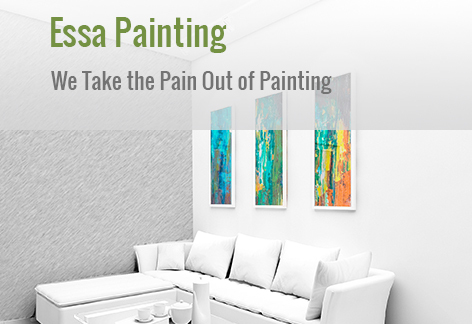 Thank you for visiting Essa painting, your premier painting solution in Barrie and area. Next time your looking for painting services in Barrie please give us a call or send us a message.